Canyon has an unscalable mountain area in the center. 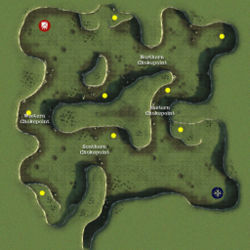 There are four chokepoints where the center mountain reaches close to the outer walls of the map, dividing the arena into four quadrants. The Northern Faction starts in the Northwest, and the Brenodi Empire in the Southeast. Chokepoints: The canyon chokepoints are critical defensive boundaries on this map. The first infantry rush towards the north and south chokepoints usually dictate who will dominate the first half of the match. NF Forward Bases: It's a common NF strategy to establish a forward base on the hill in the far Southwest corner of the Southwest quadrant: (A1/A2). This gives the NF team easy access to the south pass, and grants their infantry tree cover on the approach. A daring commander can comm-rush this position and set up a barracks quickly. BE Forward Bases: Brenodi commanders usually establish a forward base near (B2/C2), sealing the chokepoint with walls and turrets. Alternatively, one could comm-rush North from the start, establishing a base near the center of the Northwest quadrant, north of the east pass at (D4/D5). This is a less defensible position than the NF base at (A1/A2). Forests at C1: NF A good NF scout can use hide and the tree cover granted in the forest at (C1) to hinder all Bren expansion into the south pass early on. Just be ready to retreat when the first tanks are produced. From these woods, one can see the far wall of the canyon before the Steam engine has rendered the Bren buildings; be sure to hold your fire until you're sure the enemy is in range. Forests at C4: Bren Likewise, a good Bren infantryman can use the forest along the southern edge of the north pass to hold back the NF forces while using the trees for cover at (C4). Be warned, however, that the first clashes usually occur just north of the east pass. By the time the Bren forces manage to get to these forests, the first tank rush could be happening soon. Beware the fields at C1/C2. Without artillery support, the field west of the Bren base can become a tank deathtrap. If the bren forces have secured themselves well, resist the urge to charge into this area. Instead, focus on containing the enemy until artillery units have been provided. This page was last modified on 6 April 2017, at 04:46.